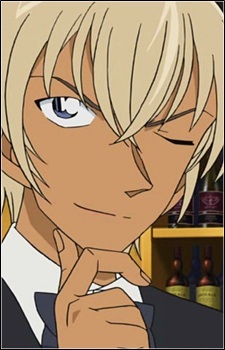 Amuro is a free-lance private detective who also maintains employment on the side that may aid in the investigation, like his part-time job as a waiter at Ristorante Sundayrino. After his introductory case, Amuro begins working part-time at Café Poirot. He is currently Mouri Kogorou's apprentice. Amuro has a cheerful personality. He is also generous, bringing a plate of sandwiches for the detective agency bought with his money. In more serious situations, he seems to be patient, keeping calm even while even while others are abusing him. Although somewhat of a "cool type," he does not hide his emotions and is quite expressive. Like other detectives in Detective Conan, he enjoys presenting his deductions about cases to others. He is also manipulative, tricking others into performing certain actions so he can gather information. Kogorou calls him "effeminate." It is revealed in chapter 823 that he is Bourbon, a Black Organization member. In chapter 897, It is revealed that his real name is Rei Furuya and is in fact an agent from the Public Security Bureau who is working as an undercover in the Black Organization.